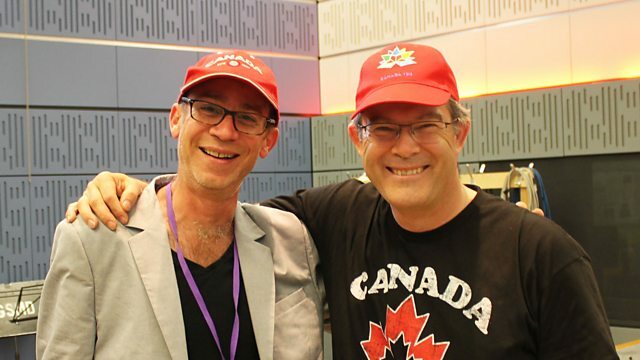 Sean Rafferty's guests include pianist Inon Barnatan and bass-baritone Gerald Finley, who perform live in the studio. Plus composer Raymond Yiu talking about his new work. Sean Rafferty's guests include pianist Inon Barnatan, who performs live in the studio for us ahead of his recital at Wigmore Hall tomorrow, which will be broadcast live on Radio 3 In Concert. Composer Raymond Yiu talks about his new piece based on the poetry of Anthony Burgess, and, as part of Radio 3's Canada 150 week, bass-baritone Gerld Finley sings live. Performer: Gerald Finley (baritone). Performer: Stephen Higgins (piano). Conductor: Semyon Bychkov. Orchestra: Vienna Philharmonic. Performer: Alisa Weilerstein. Performer: Inon Barnatan. Orchestra: Chicago Sinfonietta. Conductor: Mei-Ann Chen. Performer: Emanuel Ax. Performer: Itzhak Perlman. Performer: Yo‐Yo Ma. Mendelssohn: Piano Trios, Opp. 49 & 66: Perlman : Ma : Ax. Singer: Andrew Watts. Orchestra: BBC Symphony Orchestra. Conductor: Edward Gardner. Orchestra: Brown University Orchestra. Conductor: Paul Phillips. Palestrina - Volume 3: The Sixteen, Harry Christophers. Orchestra: Vienna Philharmonic. Conductor: Christoph Eschenbach. Singer: Anna Bonitatibus. Ensemble: La Floridiana. Conductor: Nicoleta Paraschivescu.